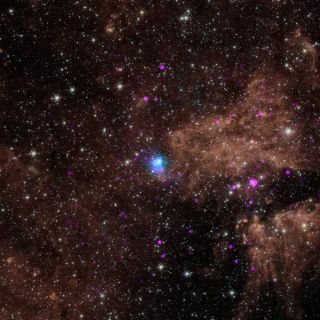 The spinning core of a dead star, shown by the blue dot in this image, is one of most luminous sources of gamma-rays in the Milky Way. NuSTAR’s high-energy X-rays are shown in blue; Chandra’s less energetic X-ray detections are shown in pink. A rapidly spinning stellar corpse known as a pulsar powers one of the most luminous sourcesof high-energy gamma rays in the Milky Way galaxy, a new study reports. The gamma-ray source had already been connected to a supernova remnant — what's left behind after the explosive death of a massive star — and previous studies hinted that a pulsar could be driving the strong energy scientists had observed. But thick gas clouds in space had kept scientists from conclusively identifying the source until NASA's Nuclear Spectroscopic Telescope Array spacecraft (NuSTAR) scoped out the area with its X-ray eyes. The Max-Planck Institute for Astronomy's HESS experiment has identified over 80 high-energy gamma-ray sourcesin the Milky Way. More than two-thirds of these have been linked to supernova explosions. Other potential causes of the gamma-ray emissions include X-ray binary stars, star-forming regions and the outer shells of supernova remnants. Still, many of the energetic sources remain unidentified. The gamma-ray source HESS J1640-465 is one of the most luminous ones spotted so far. Earlier surveys made by NASA's Chandra space telescopeand the European Space Agency’s XMM-Newton spacecraft allowed for tentative identification of the source as a pulsar — a superdense, rotating core of a star that exploded in a supernova. Pulsars emit electromagnetic radiation, which appears to pulse because the beams are only visible when the pulsar is pointed at Earth. HESS J1640-465 lies about 42,000 light-years from Earth, making the clouds of dust and gas between it and the solar system a challenge to peer through. Enter NuSTAR, whose ability to detect X-rays with higher energies led to a solid identification of the source. Unlike their weaker counterparts, high-energy X-rays are able to break through the gas and emerge on the other side. NuSTAR determined that the high-energy X-rays were delivered in steady pulsations that indicated the source was a pulsar — a previously undiscovered one named PSR J1640-4631, which spins five times every second. "The discovery of a pulsar engine powering HESS J1640-465 allows astronomers to test models for the underlying physics that result in the extraordinary energies generated by these rare gamma-ray sources," Gotthelf said in the statement. Launched in 2012, with its mission extended to 2016, NuSTAR serves as a sensitive instrument for finding young, obscured pulsars in distant parts of the galaxy. "Perhaps other luminous gamma-ray sources harbor pulsarsthat we can't detect," co-author Victoria Kaspi, of McGill University in Canada, said in the same statement. "With NuSTAR, we may able to find more hidden pulsars." The new findings were published in June in the Astrophysical Journal.